Our world is now spinning into the Fall…the dark time of the year. Halloween is one of the great holidays for magicians, and for those of us who love masks! We all wear many faces each day. You wake up in the morning and show your sleepy face to your partner. You go to work with the mask of a business person, then after work, the mask of a friend, a lover, or even that of a great entertainer. From my own experience, I feel that we are all illusionists who shape-shift to fit the moment or social situation. Just think about how many interactions you have each day in person or online. Facebook can be a mask. Many show only the best parts of their lives–others show off the mask of the victim reaching out for help. 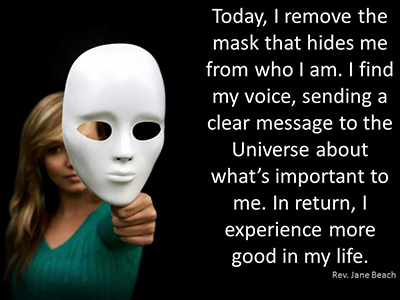 But remember this–you have the power to take off the masks! A few years back my friend Tim Cridland gave me a fascinating book by sociologist Irving Goffman. The Presentation of Self in Everyday Life is about the many roles we play in life. We are all actors playing the best part we can. Even playing the part of “being authentic” is a mask that we can put on or take off at our convenience. This magazine issue came out in 1965. I found it in an old pile of magazines around 1967. 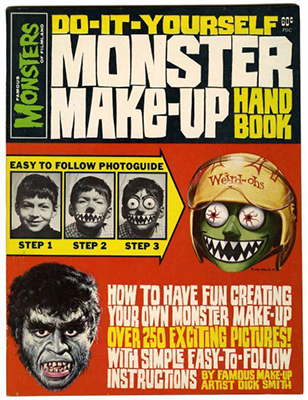 This is the magazine that changed my life and why I decided to wear masks… LOTS of masks. I remember the day my Don Post “over the head” Wolfman mask came! I was in heaven and I did not take the fuzzy mask off for days. Lon Chaney was one of the top “monster actors” in Hollywood, and he was my hero! I experimented with masks and makeup almost every day! 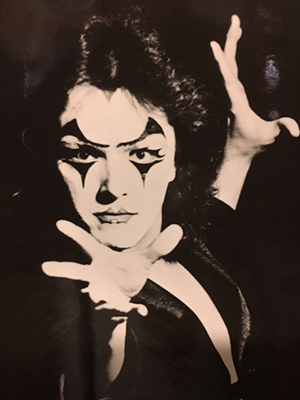 Here is an early image of my mime makeup from ten years later in 1977, after much influence from the master pantomime artist Marcel Marceau, and rock group KISS. Who do YOU see when you gaze into the Mirror? It took many years to perfect my style of makeup. Here is a rare old clip from a TV series I did years ago in the UK, called The Best of Magic. Who are the “NEW FACES” of Magic? Just click on the link here to see many of our top award-winning students. Now you can see how these new talents are unmasking their power and magic! 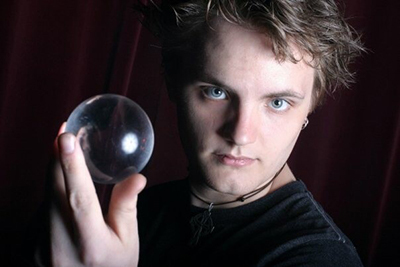 William Bradshaw has been with the McBride Magic and Mystery School for the last 7 years. In his first year performing professionally, Will was awarded the Cracked Cup for the most entertaining street performer at the Minnesota Renaissance Festival. Two years later, he was named the Most Improved Entertainer by the same festival. He has studied theater at the American Musical and Dramatic Academy and the University of Minnesota. He recently was a featured performer at the world-famous Magic Castle, on Penn & Teller’s Fool Us and on the first international tour of Las Vegas Magic Stars. “My greatest goal with magic is to create real moments of emotional connection for my audience. To do this, I break down my script into beats (smaller sections within a script), and then write down what I feel each moment, what I want the thing or person I am interacting with to feel, and in what way I am doing that. This allows me to tell what moment I am attempting to create, and whether I am being successful in creating it. October Events: The BEST in Vegas! Three Awesome Shows: Parlor magic, Stage magic, and Close-up magic – the longest running independent variety & magic show in Las Vegas history! 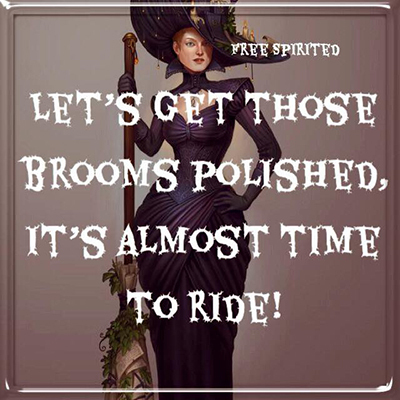 The Witches and Wizard’s Ball is happening on Friday, October 26th at The Olive in Las Vegas! Doors open at 7:30pm. Music, dancing, performances and prizes continue all night long until midnight! 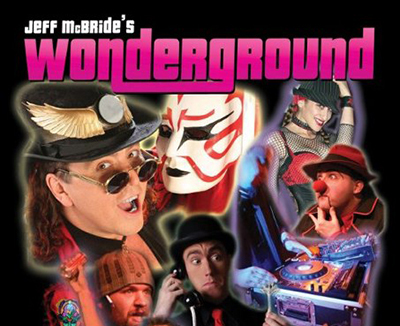 …with DJ LeoD, the New World Rhythmatism Dancers, Spiral Dance and Community Ritual, over $500 in prizes for creative costumes, the Mystery School Magicians, Scott Steelfyre’s Legendary Coffin Ride, The Psychic Sideshow, big surprises and much more! Creative and festive costumes and masks are wholeheartedly encouraged, but not required. The Witches & Wizards Ball is a fundraiser that makes Mysterium and MayFire possible, so thank you in advance for your generous support!! What is the BEST magic effect of the past few years? 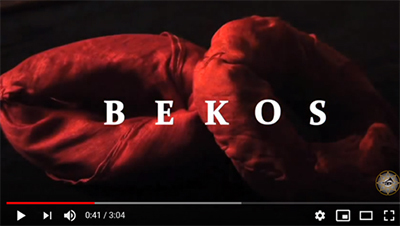 Many top magicians say that BEKOS is one of the most versatile and practical magic effects ever! The new knots are here and better than ever! No jamming- smoooooth as the silk! Have a great Halloween…and remember to take off that mask after the holiday! October’s Muse comes to us from across the Atlantic from our good friend Jay Fortune. 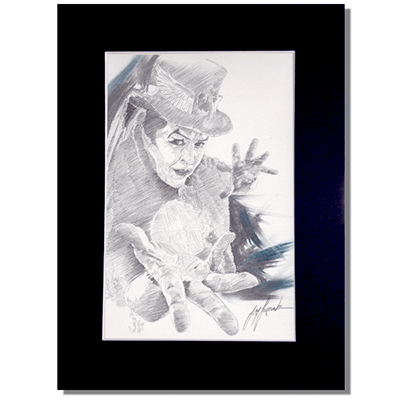 You might know Jay as a fine magician, as an agent booking top touring talent… or in his most recent re-incarnation as a graphic artist, specializing in pencil sketches of some of magic’s great luminaries…. Like the two below. We’ve known him as all that, and the best host our team could have on our recent tours of the U.K.
Dear friends, this month we are hosting an annual magical celebration that we all anticipate more than any other (it’s my 40th birthday) and with the Magic & Meaning Conference also happening, I thought that for my first ever Museletter contribution, I’d look at the magic we do, and the meaning we often get entangled with along the way. Then we can discuss my birthday. If you’re in a rush, here’s the gist; be careful if your magic is saying one thing and your words another. As a Libran (did I mention it’s my 40th birthday this month? ), finding balance is something I’m supposedly good at. For the doubters, please check out my Yoga Tree position. As magicians, how do we balance our audience expectations with the story we wish to tell? Sometimes, the story is powerful and magical enough on its own. Sometimes, the magic is powerful enough on its own. How do we blend the two without confusing our audience? I offer this recipe up for your kind consideration. Call back, once, maybe twice to the theme during the presentation. As you progress with your fusing of theme and magic, you’ll become more acquainted with your performing rhythm, and find the best balance for you to inject your own stories into the natural beat of your magic. I performed a one-man show in London for years, which was all about magic with meaning. Subjects such as death, horror, suicide, drugs, love, heart, joy, envy, terminal illness, our future, our past, our fears, and our phobias were all explored through magic. So, make your themes interesting, relevant and don’t tangle the web you weave. Friends, I wish you all a meaningful conference later this month, and a huge shout-out to this year’s guest of honor – the legend that is George Parker. Totally deserved. This might be the BEST PHOTO EVER! It photo captures a moment in time that is priceless! Who is the best magician in the USA? For many TV viewers and the judges of AGT, it has to be Mat Franco. Mat Franco Won America’s Got Talent…. He beat out the competition and now has his full evening show on the Las Vegas strip. But did you know that years before, he was a student of mine? Read what he has to say…it made me blush! 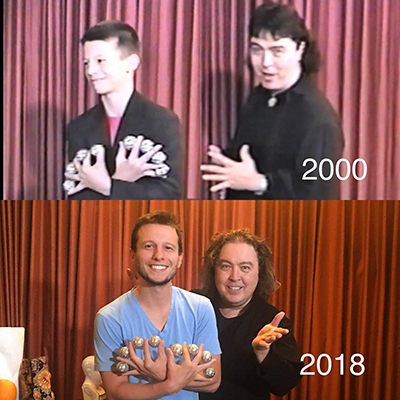 “If not for Jeff McBride, there would be no Mat Franco! This guy was my biggest, and one of my earliest inspirations in performance/magic! I was beside myself to meet him in person all those years ago. 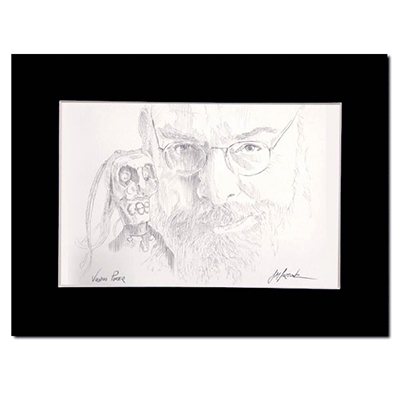 He is deserving of the wide array of awards and accolades he’s received in the world of performance and magic. He inspires so many magicians across the globe, and the magic community is a better place because of him. Thanks Jeff for all that you do for our art! !” — with Jeff McBride. Want to change your life the way Mat changed his? Click here to look at the magic class that just might do that! 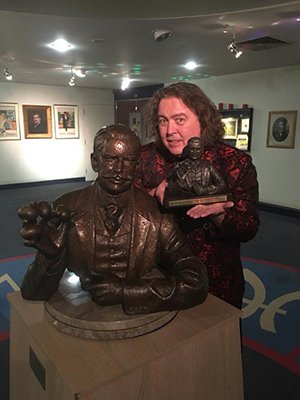 September 3, 2018 Las Vegas, NV – Last night, at their headquarters in London, The Magic Circle presented Jeff McBride with The David Devant Award. Among the highest awards bestowed in the world of magic and illusion, the Devant award is given to those who have made a significant contribution in advancing the art of magic, or who have given outstanding service to magic internationally. 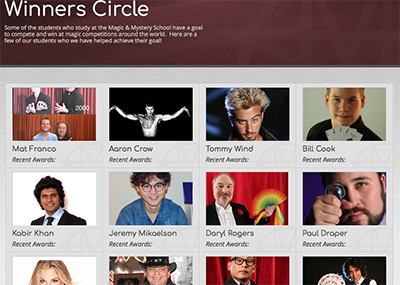 The trophy is a miniature bust of David Devant, the first President of The Magic Circle. The original life size bronze is on permanent display in the Magic Circle Headquarters. 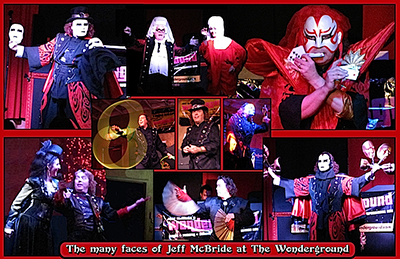 A 10-year headliner at his popular McBride’s Wonderground, in Las Vegas, Jeff McBride has long been known as a foremost innovator in the world of magic, being among the first to incorporate masks and pantomime with world-class sleight-of-hand skills. His early career saw him as opening act for such superstars as Diana Ross & Tom Jones. Later, his full-evening shows won rave reviews off-Broadway, in Atlantic City and Las Vegas. He is founder of the McBride Magic & Mystery School in Las Vegas, McBride’s Wonderground (magic nightclub), and can be seen regularly on such popular television shows as Masters of Illusion and Penn & Teller’s Fool Us. He is author of the book The Show Doctor and host of the Monday Night Mystery School webcast, currently with over 350 episodes archived. Earlier this summer, McBride was presented with one of the magic world’s other highest honors, the International Fédération Internationale des Sociétés Magiques’ (FISM) Theory & Philosophy Award. 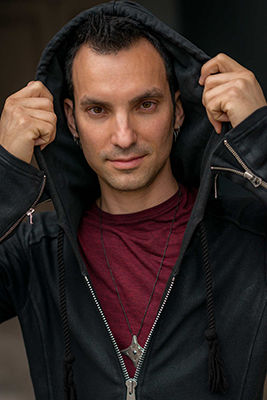 Los Angeles based magician Michael Tetro has devoted over 10 years to the art of magic and illusion. 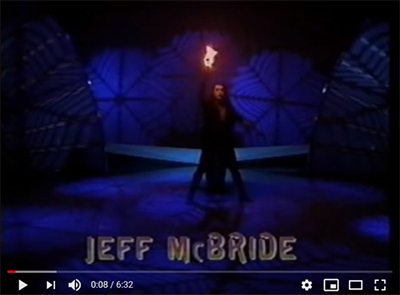 He honed his skills while studying under Magic Teacher of the Century: Jeff McBride, and has attended the prestigious Magic and Mystery School in Las Vegas. 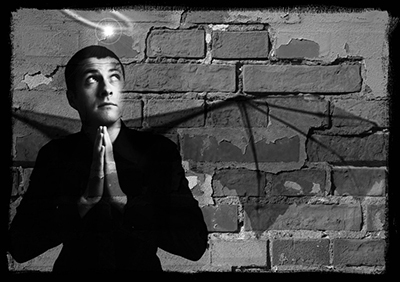 Specializing in highly visual sleight-of-hand magic, Tetro creates engaging and memorable performances. He tours locally and internationally as a solo artist and with performance groups. He’s performed for America’s Got Talent, Facebook Corporate, Universal Studios, and more. Tetro is a magician member of The Magic Castle in Hollywood, a member of the Society of American Magicians, and a member of the International Brotherhood of Magicians. Chris Britt – Magic and Mentors? Scott Steelfyre – Very Nice-Dice! Nathan Phan – The New Las Vegas Legend! See you on the road or here in Vegas! 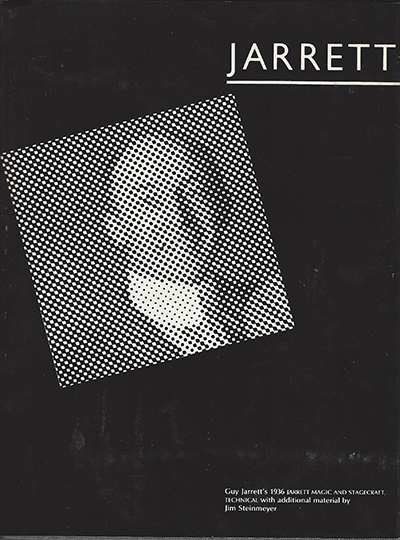 Our guest author this month is John Tudor—one of our earliest participants in Mystery School events, way back when “Mystery School” was just an annual gathering at an Ashram in upstate New York! John has a background in acting and theater, as well as in magic. Enjoy! And now, I give you John Tudor! No, these words aren’t a review of amateur magicians on YouTube. They come from Magic and Stagecraft, by Guy Jarrett, published eighty-two years ago! 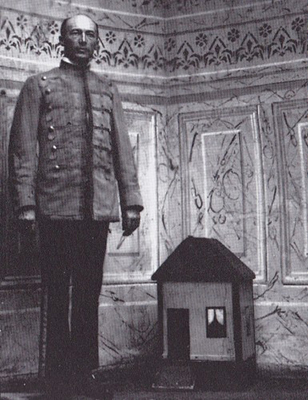 (1936) Jarrett was a prop man on Broadway, and creator of illusions for Thurston, and all of the greats of his day. He came to that dim conclusion after seeing every act that came through theaters and vaudeville for several decades. What would Jarrett think of the stage magic shows of today? No doubt he would be impressed by some, and appalled by others. 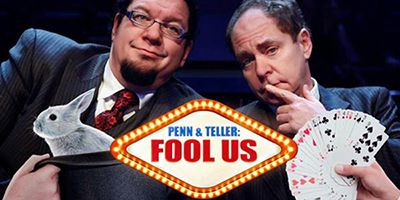 The excellent TV show, Penn & Teller: Fool Us, has given us a unique cross-section view of international magic talent. The magicians have been some of the most polished professionals around, as well as what a friend calls “inter-changeable guys with cards. Fool Us has had a democratizing effect, where clever hobbyists appear along with top pros. The acts that stand out, to me, and probably to Guy Jarrett, are those that could do their act for that large studio audience without the benefit of cameras and close-ups, or even a microphone. Some performers are “naturals,” of course, but for the most part the better acts you see on Fool Us are the result of the training and direction that Jarrett found missing. They have developed a stage presence, and learned to act, at least a bit. Yes, I am “preaching to the choir” here, but you can really see the difference if you watch episodes on YouTube. Some acts know what to do in terms of theater, while some seem to relate mostly to the camera. What’s wrong with that, you may ask? Nothing, I suppose, but in a larger sense, the artist is severely limiting him or herself. They are more likely to become “interchangeable” with everyone else, and to limit their own imaginations. For those of us fortunate to be older, our heroes were Mark Wilson, Doug Henning, Thurston and Blackstone. Magic was something big and expansive, especially when it came to David Copperfield’s tricks with world landmarks. I remember an article in the science magazine OMNI asking what magicians of the future would be doing…? The author imagined we would we be sawing Manhattan Island in half, or levitating the Eiffel Tower. Instead we had the deconstruction of magic with the coming of David Blaine. The focus shifted to small magic, which has been solidified in the current YouTube era. I feel this may create a somewhat stunted vision of the art. Many think of magic primarily as something small, to be done for a camera, watched on a computer screen, or a projected video. They are much less likely to learn the skills that theater work requires: stage presence, direction and training that Jarrett saw as lacking. Of course the issue is not the size of the venue or the props. Close-up and parlor magic are just as viable as forms of the art. And, it’s not even the technical aspects of stage work; like voice, posture, facial expression, and so on. That’s all the outer part of what actors call their “instrument.” Stage training is also very much about the inner part of the instrument: the imagination, visualization, memory, life experience, and so on. Acting is in many ways a spiritual exercise, an expression of who you really are, understood by playing someone else. Let’s set aside the metaphysical, and speak in more practical terms. A theater manager once told me, “We (theaters and performing arts centers) are all doing these mind-reading and card trick shows, on projection screens. We do good business with these too, but they all seem the same.” The magicians seemed interchangeable to her, and she wondered whether they would grow an audience. My opinion may seem obvious, but I truly believe it. The better trained you are (aside from with the use of media) the less interchangeable you will always be (even projected on a big screen). I think the stage presence/acting aspect becomes even more crucial in a TV or media heavy production, than in a “normal” magic show. Robust, she said. Robust… I confess I’ve spent a lot of time pondering what she meant by that choice of words! Perhaps it is different for everyone, I don’t know. I am sure, however, that you, the reader, would prefer to seem “robust” than to seem “interchangeable,” wouldn’t you? Then don’t just watch YouTube, or Fool Us. Think hard about Guy Jarrett’s words. Get some training, some direction, work on your stage presence, take an acting class…or a Master Class. You’ll find yourself much happier, to be a champion, rather than a murderer of the art. Dare to Live the Life You’ve Always Wanted!